Fulbright Scholarship Scheme for the Masters and Ph.D Program are now open for the year 2019-20. Fulbright is the flagship Scholarship Program from the US Department of State to the Students of Pakistan. Higher Education of Pakistan is also collaborating with Fulbright to provide funded scholarships to PhD students. These PhD awards are also managed by Fulbright under their policies and regulations. 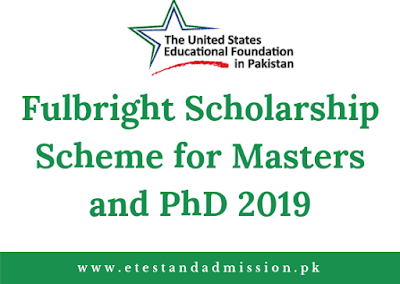 The major goal of the Fulbright Scholarship Scheme is to provide quality education to Pakistani Students in top Universities of the US and to promote mutual understanding between the people of the US and the people of Pakistan. Must be residing and studying in Pakistan. -Minimum 16 years of education from an accredited University. -Minimum 18 years of education from an accredited University. Note: Candidates completing their degree in 2019 are eligible to apply as long as they will provide the final transcript by December. Candidates are eligible to apply in all the fields of study except Clinical Medicine. However, the candidates are encouraged to apply in the fields of Energy, Water, Agriculture, Public Health, Education, Social Sciences, Journalism and Mass Communication, Arts and Culture Management including Heritage Conservation and Museum Studies, Urban and Regional Planning, Environmental Science / Studies, Security / Peace Studies, and Data Science. Note: Candidates applying for Public Policy / Administration or MBA must have 2 years of experience. The total number of awards for MS and Ph.D Programs are 130. Candidates can apply online via the link given below. Create a new account and then log in to your account. Fill the form carefully and upload all the required documents.